Portraiture Photography for all occasions! Our 11th Year at Stewart Hall! Only 10 spots - register soon to join this workshop! Learn how to pose and take superb portrait photos of family, friends, colleagues, your baseball or soccer teams, group photos and more in natural light, or combined with an external flash. Learn how to shape with light using inexpensive photographic umbrellas, reflectors, bounce flash attachments, and various light modifiers like soft boxes for unique lighting effects! A powerful external flash, either on or off camera, provides a wonderful opportunity for creative lighting for portraits, family events, class and group photos, and weddings; not possible with a built in, or "pop-up" flash. Lessons on flash fill techniques, camera settings, lens choices, metering and more will advance your skills. Sessions include posed model photography, both indoor and outdoors (weather permitting), using various sets and backdrops, portable flash umbrellas, plus hands-on group photography. Four challenging assignments with helpful critique will enhance your skills! Nikon, Canon, Metz, Vivitar, Sigma, etc. 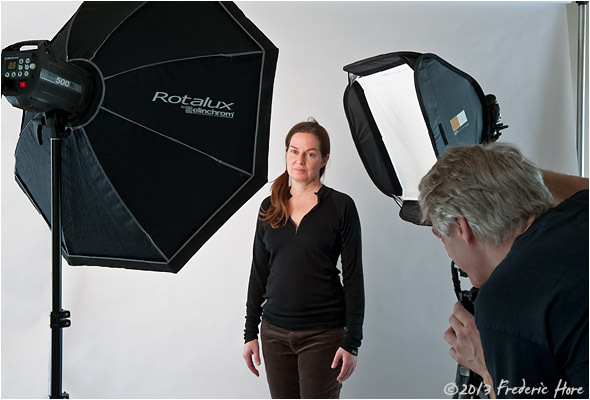 Pop up flashes can be used, but are less effective. - Creating stunning black and white images, sometimes with a touch of colour! Printed handouts, a posing guide and emailed PDF's provide detailed information of the topics covered. Four challenging Photo Assignments will help you practice techniques learned each night. Participants will be encouraged to submit completed projects on a USB key, to evaluate and provide insightful critique of their imagery. A Resource List of recommended books and a "Where to Buy" directory of lighting gear will be supplied. If a French form appears and you want English, click on the English link top left. Then in the search box, type: photography. Press Enter. Select this course! 176 chemin Bord-du-Lac/Lakeshore Road in Pointe Claire. © 2015 Frederic Hore. All Rights Reserved.